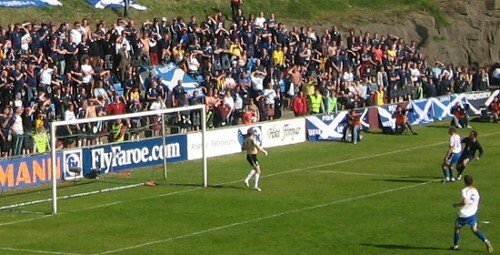 The Faroe Islands rue host of missed scoring opportunities in the second half when the Scots were overrun for long periods of the half, but Scotland dominated the first half, although they created few real scoring opportunities, but took full advantage of Faroese mistakes to get their two goals that won them the game. The first piece of drama happened after 5 minutes in connection with a Scottish corner. Faroese defender Óli Johannesen got a boot in his head from team-mate Rógvi Jacobsen and had to be stretchered off. He returned to the action 9 minutes later. He was however substituted again on 36 minutes. Also Scotland's Graham Alexander received an injury and had to go off to get stitches. He returned about 5 minutes later. Scotland's first scoring opportunity came after 23 minutes. 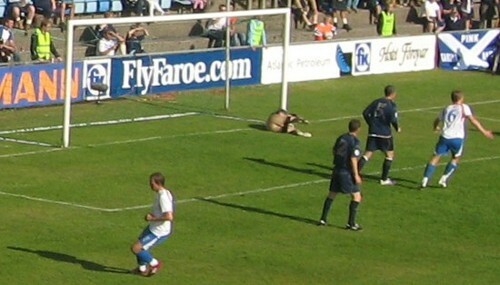 The Faroese defense didn't manage to clear away a long high ball into the penalty area; it fell to Garry O'Connor who made a hook with his left foot, but Faroese goalkeeper Jákup Mikkelsen dived and pushed the ball on to the post and out for a throw-in. Five minutes later, Scotland came close again. 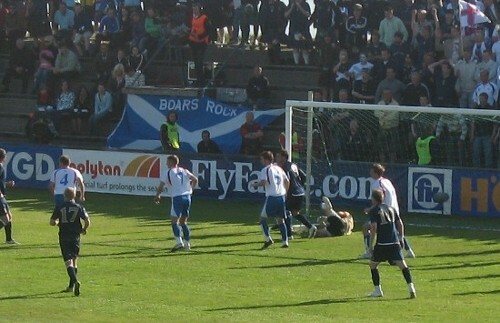 Again it was a long ball that led to an opportunity for Scotland when central defender Fróði Benjaminsen's attempted clearance played Kris Boyd free just outside the right hand corner of the goal area, but Boyd volleyed the ball wide. But a couple of minutes later, Scotland took the lead. In a race between Boyd and Faroese central defender Óli Johannesen, Johannesen used his hands a bit too much to drag Boyd down and Scotland was awarded a free kick 20 meters from goal (maybe Johannesen was still groggy…). Shaun Malony coolly placed the shot over the wall and into the back of the net while the paralyzed goalkeeper just looked at it. (However, Boyd seemed to fall rather easily, and it certainly was much less of a free kick, than it was a penalty when Rógvi Jacobsen's shirt was almost taken off him in the Scottish penalty area earlier in the match). Just 4 minutes after, Scotland had doubled their lead. In this case the Faroese defenders seemed to be only extras. 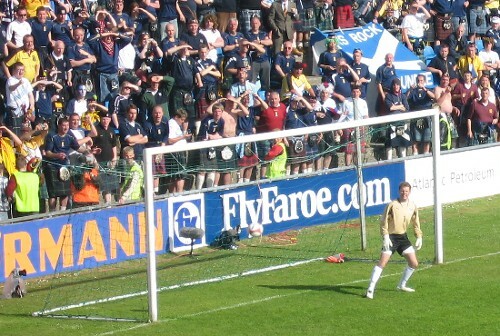 – Darren Fletcher received the ball in the penalty area on the right hand side, and although surrounded by 2 defenders, he was allowed to turn and make the cross into the goal area, where Garry O'Connor escaped his marker who just stood there watching with a raised arm appealing for off side, and although keeper Mikkelsen made a fabulous save from O'Connor's initial header, there was nothing the goalkeeper could do with the rebound which O'Connor slotted home… while the Faroese defender was still just standing there watching with his raised arm claiming off side which it was not! The second half, however, was a completely different affair. The Faroes improved immensely and completely dominated the match and created several scoring opportunities. The first one came after 5 minutes. Christian Høgni Jacobsen on the left hand side used his dribbling-skills and pace to get into the penalty area and made a cross, but Jákup á Borg steered the half-volley from just outside the box over the goal. The minute after, Scotland were again under pressure. Again it was Christian Høgni Jacobsen who had escaped his marker, and from the same position as in the previous attack, he passed the ball to Rógvi Jacobsen in the goal area, who instead of shooting himself squared the ball to Christian Lamhauge Holst whose shot was blocked to a corner in the last moment (although the referee gave a goal kick). Ten minutes into the second half, Súni Olsen had a couple of shots at goal. The first from a free kick from 25 meters, which the Scottish goalkeeper Craig Gordon punched away. The ball ended at Olsen's feet again and for the second time he curled the shot goal-wards, but this time the goalkeeper dived to his left and saved the low shot comfortably at the near post. 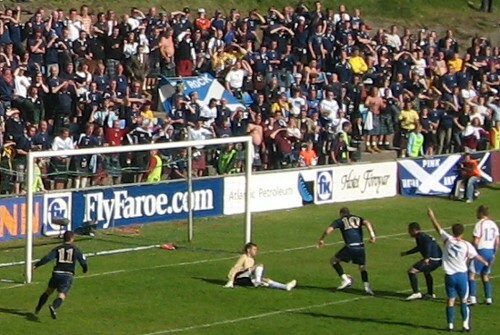 3 minutes later, Christian Lamhauge Holst used his chest to set up Mikkjal Thomassen for the shot from 25 meters, but it went 2 meters wide of the Scottish goal. On 68 minutes a Faroese free kick just outside the center circle is knocked into the Scottish penalty area where Christian Lamhauge Holst heads the ball behind himself and onto the post via the goalkeeper's hand, but unfortunately it bounced straight back into the goalkeeper's hands. Two minutes later, Scotland had their first opportunity of the second half. 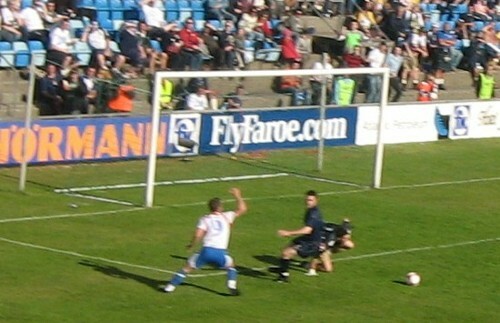 After a corner, David Weir raised highest to head the ball against goal, but it was saved on the line by a defender. David Weir was at it again after another corner on 41 minutes, but Jákup Mikkelsen got a hand on the ball from the header to stop it going in. A couple of minutes later, the Faroes went close again at the other end. Rógvi Jacobsen won the air duel on the center of field and the ball fell to Andrew av Fløtum who brilliantly lifted the ball over Scotland's last-line defender, but with only the goalkeeper to beat, Fløtum fired his shot on the crossbar. The match ended with a 2-0 victory for Scotland, but it really could have been so much different if the Faroe Islands had converted some of their scoring opportunities in the second half. And because of their superb performance in the second half, the Faroese really deserved to get something out of this match.